Bijou - A gem of a little salon in Skaneateles: Another lesson learned...don't have something delivered before seeing in person first! Another lesson learned...don't have something delivered before seeing in person first! 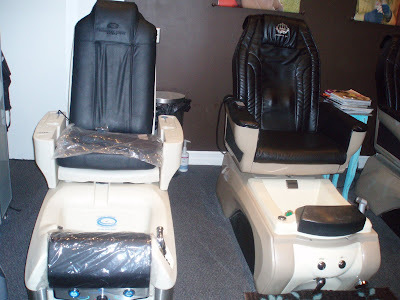 Okay so last night (late last night) I made a very excited post, knowing that at 8am the next morning our luxury pedicure chairs were going to arrive at the salon! Well excitement fell flat when I looked closely, although he tried desperately to convince us that they were the ones that I had indeed ordered, I knew they were not, finally after a little while and me looking online at the one that I had ordered, he agreed, he must have ordered the wrong ones. A few things were missing, and although from an engineering point of view (one that is considered very carefully of course) it was an improvement, esthetically they looked like we downgraded and the seat was not as plush and soft as our made in china ones, but they also had manual recline and pulling forward or back, a cheap option if I do say so myself! So after he set them up and brought one inside, we both vetoed it. Sigh, back to the drawing board, I am waiting right now for him to give me a quote on another model and our lesson was learned....never have something delivered without actually seeing it in person!! Online it looked fine and nice, but in person it just wasn't to our standards that we strive for at the salon. One thing that really bugged me was the material used for the base, it was just like the material used in he kids toys, the big outdoor ones, like the little tykes stuff. But as the guy said, they use that because its durable and can withstand kids....So sorry to deflate any ones excitement about the new pedicure units, (couldn't be more deflated than mine;) but soon they will come and then we can celebrate!